A Hong Kong woman convicted of abusing her Indonesian maid has been jailed for six years. Law Wan-tung was found guilty earlier this month of causing grievous bodily harm, criminal intimidation and failure to pay wages. The maid, Erwiana Sulistyaningsih, drew global attention last year when she returned to Indonesia in need of hospital treatment. During the trial, she described being beaten and starved by her employer. The case drew intense scrutiny in Hong Kong, where a significant number of families rely on domestic helpers. The city's residents employ about 300,000 maids from other parts of Asia, mainly Indonesia and the Philippines. In addition to the jail sentence, Law, 44, was also fined HK$15,000 ($1,934; £1,253). She had faced a maximum sentence of seven years. During the six-week trial the court heard that Law beat Ms Erwiana with various household objects and deprived her of proper food, allowing her only a small portion of rice and bread. Law, a mother of two, only allowed Ms Erwiana to sleep four hours a night. On one occasion Law punched the maid so hard that her incisor teeth fractured. Handing down the sentence, Judge Amanda Woodcock said Law "showed no compassion" to Ms Erwiana and other domestic staff. Law saw them as "people that are beneath her", Judge Woodcock said and called for an investigation by authorities in Hong Kong and Indonesia into workers' conditions. Twenty-four-year-old Ms Erwiana arrived in Hong Kong in 2013. She went home to her village in Central Java in January last year after working for Law for about eight months. She came home beaten and bruised, too weak to walk and without any money. Her face, hands and legs were covered with scabs and lacerations. Parts of her skin were blackened and peeling. The BBC's Karishma Vaswani says images of her battered body made headlines in Indonesia, leading to public outrage. 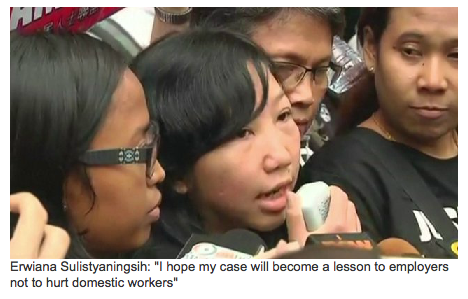 Her case has prompted the Indonesian government to look at better ways of protecting its migrant workers, she adds.